MANUU UGC NET Coaching Admission 2019 Notification and Download the UGC NET Coaching Application Form : Maulana Azad Nationa Urdu University, Hyderabad is a Central University has given an admission notification for UGC-NET Coaching Classess for Minorities. 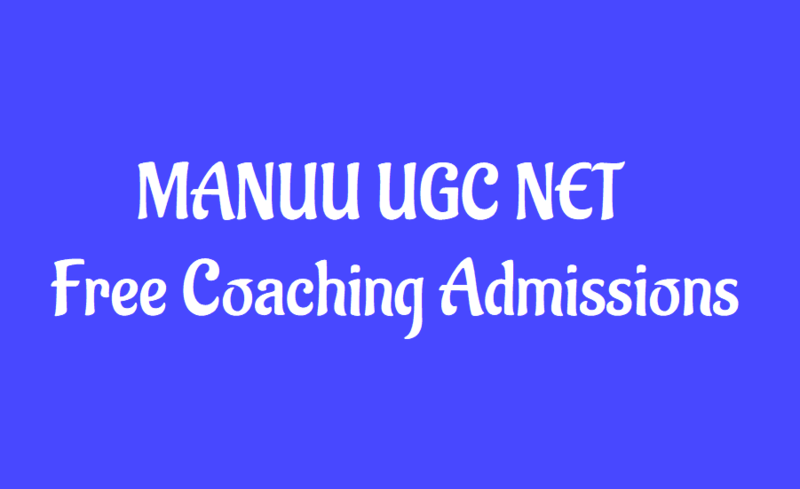 The UGC-NET Coaching Centre at Maulana Azad National Urdu University is offering coaching classes for the UGC-NET exam scheduled to be held in last week of June 2019. The Centre will arrange Coaching classes for Paper-I compulsory subject (General Studies and Teaching Aptitude) and in Papers II & III in the following subjects: Urdu, English, Arabic, Persian, Hindi, Public Administration/ Political Science, Management, Social Work, Computer Science and Application, Womens Studies, Education and Mass Communication. Coaching in paper-II & III will be provided if the applicants are 10 and above in a particular subject. Candidates desirous of enrolling for the coaching classes may obtain application forms free of cost from Room No. 201 ITI Building, Maulana Azad National Urdu University. The same can also be downloaded from the University website www.manuu.ac.in. Eligible candidates should send the Filled in application from along with DD. Of Rs. 200/- (Registration Rs. 100/- + paper-I fee Rs. 100/-) in favour of Maulana Azad National Urdu University (MANUU) payable at Hyderabad to following address.